Complete your home dicor with the simple contemporary elegance of this bright white TV console. Featuring 4 spacious storage drawers for your entertainment accessories and 2 open storage shelves for your electronic components, this piece is the perfect blend of fashion and functionality. Sleek track metal legs and silver coloured drawer handles provide a modern look that makes this console a must have in any home. Create a European look to your living space with this contemporary bright white TV console. The thick paneled frame paired with a tempered glass centre sliding door, is supported by stylish sleek silver legs. 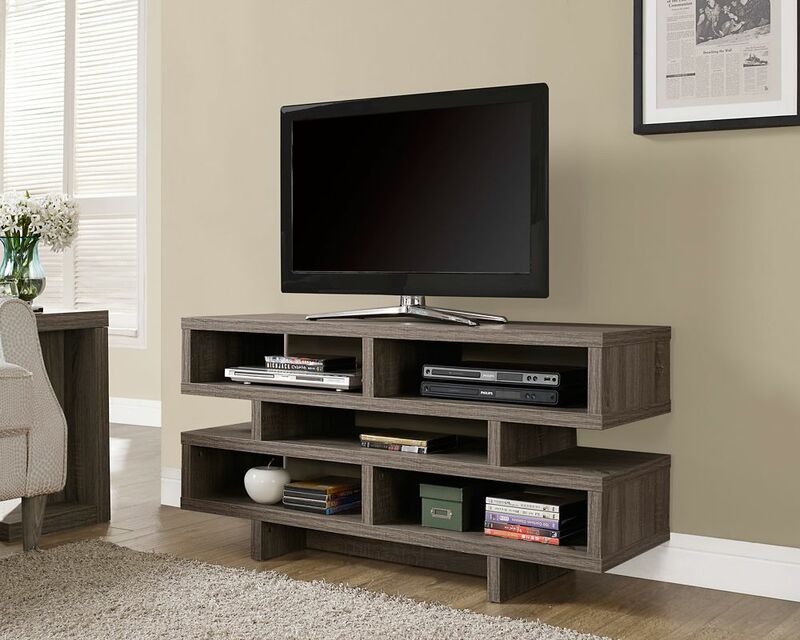 Featuring 4 storage drawers and 4 centre shelves, this TV stand will meet all your media storage needs in style. This 58 inch wood TV stand is the perfect solution for your entertainment needs. Includes a removable, universal TV mount crafted from powder coated steel that will accommodate most flat panel TVs up to 60 inches. Features adjustable shelving and a cable management system for your components and accessories. Create a warm, entertaining space in any room of your home with this wood media stand and electric fireplace. Crafted from high-grade MDF with a durable laminate finish to accommodate most flat panel TVs up to 60 inches. Features adjustable shelving to fit your components and a cable management system. Installation requires no technician, simply plug into any standard household outlet and no venting required. Dark Taupe Reclaimed-Look Hollow-Core 48 inchL Tv Console Modernize your space with this open-concept, reclaimed look contemporary TV console. With a thick panel design and 5 open concept shelves perfect for storing electronic components or displaying your favorite decorative items, this piece is a must have in any home. Dark Taupe Reclaimed-Look Hollow-Core 48 inchL Tv Console is rated 5.0 out of 5 by 1. Rated 5 out of 5 by Molly from Easy to set up - looks like picture! I bought it even though there were no reviews and I’m glad I did! It’s really nice and it was relatively painless to set up. Looks like the photo. Colour looks great against my teal and white walls!